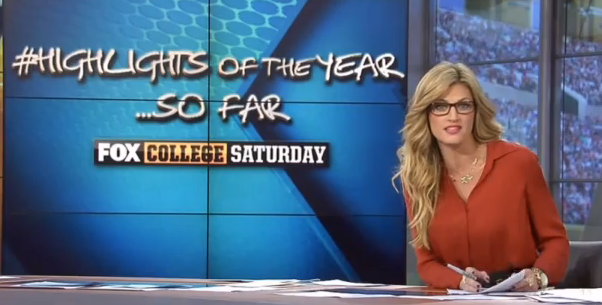 FS1 already giving up on Fox College Saturday? We’re almost approaching the one year anniversary of Fox Sports 1 and it’s difficult to call the first 12 months anything but a disappointment. Sure, there have been some positive developments at the network and new stars made like Jay Onrait and Dan O’Toole, Gabe Kapler, Katie Nolan, Julie Stewart-Binks, Molly McGrath and more. Fox Sports Live has evolved and grown into something that’s a decent SportsCenter alternative that actually shows hockey highlights. And the network has been able to dip its toes into a number of major live sports like BCS college football, MLB, and NASCAR. However, the disappointing news certainly outweighs the encouraging news. Ratings for original studio programming has been abysmal, with the network’s flagship show Fox Sports Live sometimes dipping down into four digits. The marriage with Mike Francesa is off to a rocky, lightly-watched start that already seems destined for divorce. And show after show has already been canceled including Fox Soccer Daily, Fox Football Daily, and Crowd Goes Wild. Of the original weekday lineup, only NASCAR Race Hub remains. At least ratings wise, the most prominent failing was that of Fox College Saturday, FS1’s attempt to go head-to-head against College GameDay. The ratings battle every week was like Homer Simpson trying to step in the ring with Drederick Tatum. GameDay outdrew Fox’s show 25-1 in ratings for the 2013 season. 25 to 1. GameDay averaged 1.83 million viewers and Fox College Saturday a paltry 73,000. If you ask people at competing sports networks how to attack a dominant show, they’ll tell you that you have to do something totally different than the prevailing leader — and FS1 appears to be heading in that direction. Multiple sources have told SI.com that Fox Sports management is considering moving Fox College Saturday to Friday night and changing up some of the staffing. There is also talk of starting a new college football show on Saturday that will be gambling-centric, similar to what Fox Sports Live did during the NCAA basketball tournament when it did live remotes from Las Vegas. Nothing is finalized as of yet. The gambling element is interesting because FS1 made a huge deal about broadcasting live from Las Vegas and painting themselves as the rebellious/hip/cool/edgy sports network that wasn’t too scared to talk betting lines. Moving more in that direction is smart for a couple reasons. First – sports fans like to gamble. Second – it draws a clearer line of distinction between FS1 and its competitors. The risk in going towards more gambling-related programming is drawing the ire of league partners and the NCAA who Fox is in business with. If it were me, I’d just give Jim Feist a call, bring back ProLine, and call it a day. It would be no surprise to see FS1 completely start over with their college football strategy considering how badly they were beaten by ESPN. If anything, it’s a more costly defeat to morale than anything else for the new network. Here was their statement of intent to challenge ESPN directly with a show fronted by one of their most famous former personalities (Erin Andrews) and it got blown out like Cumberland College facing Georgia Tech. With Andrews taking a bigger role at the NFL on Fox, it’s hard to see her as part of any reboot. Fox wouldn’t want to associate one of their biggest names with the failure of Fox College Saturday and I doubt she’d be too keen on a Friday night show that, again, would project low ratings. For what it’s worth, a source told AA earlier this spring that the future of Fox College Saturday was in doubt, but we were unable to gain any further confirmation that was indeed the case. Now it’s apparent FS1 will indeed hit the reset button for Year 2 on not just college football, but a lot of the network’s original programming. Pingback: Is Credit Repair Legal in Nevada?